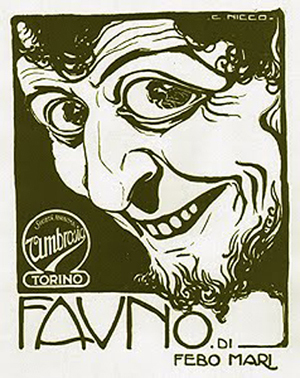 The dream and the myth: Il fauno | The Faun (IT 1917) | Silents, Please! Do not flee from me, for I am love. In his character’s introduction, Febo Mari sets the tone for this phantasmic film in which desire and mythology intertwine. In a reverse Pygmalion scenario, an artist’s model, her sculptor-love unfaithful to her, dreams a faun into life—the two fall in love, and escape to their own pastoral world, living outside civilisation. Yet they cannot remain undisturbed in their garden of Eden forever—the outside world intrudes, as well as the messiness of human emotion. Can love be stronger than myth? 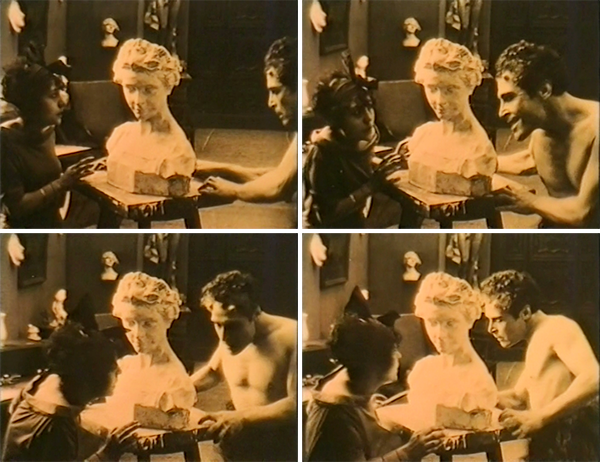 The characters in the film are more archetypes than individuals, and are named accordingly: Nietta Mordeglia is Fede (Faith), the artist’s model; Mari is Il Mito (The Myth), or the faun; Elena Makowska is Femmina (the Woman), also referred to as the Principessa; and Vasco Creti is Arte, the sculptor. (Interestingly, some of the characters are given regular names within the narrative too, which seems extraneous). I lash the luxuries, the customs and vices of my time and, for the sound spirits of the world, I sing first the song of love.” As such, Il fauno is explicitly allegorical, sometimes recalling the D’Annunzian decadence of Il fuoco, though more grounded in the real world than that classic Menichelli film—yes, even despite Il fauno‘s mythological focus. It’s an ambitious approach, and it’s to Mari’s credit that he basically pulls it off. Il fauno is an intriguing film in general, but I find it especially interesting because it so explicitly foregrounds female desire and subjectivity. While it’s true that Mari places himself at the centre of the film—indeed, he’s shirtless throughout!—it’s through Fede’s dreaming imagination that the faun is conjured up: a lover who is tender, who protects her, who laughs with her, who lives with her in their idyll. This aspect of the film is undercut in some ways: there’s a scene in which the faun forcibly cuts Fede’s hair, telling her, “I deprive you not to harm you, but to protect you.” Thus, even in their arcadia, proprietary masculinity encroaches. Or is it an intentional reverse-Delilah scenario? But nonetheless, Il fauno displays an interesting turnabout, in that sculpture, traditionally associated very much with the masculine, here becomes a vessel for female imagination. Likewise, there is warmth and tenderness in their other interactions. It’s not there all the time, but Mordeglia and Mari do a much better job of convincing me of their connection than your average diva film couple, in which the man is often more of a prop than a person. But then, the Italian teens were all about the female divas; aside from Maciste and the other strongman characters, Mari is, at least in my opinion, one of the stronger male presences, and he’s not just a divo but also something of an auteur. Mordeglia had a short film career, acting in several of Mari’s other projects in the late teens, including Attila (1917), Cenere (1916—Eleonora Duse’s sole cinematic outing), and a 1919 adaptation of Ibsen’s A Doll House, in which Mordeglia played Nora. She later played some TV roles in the 1970s. While she isn’t a knockout performer, I generally enjoyed Mordeglia’s performance in Il fauno. It would be very interesting to see how she would have fared opposite a different lead actor; but then, if you can play against Mari, why would you look elsewhere? And here, we see her shrink away from the statue of the faun. In other words, it’s a standard Makowska role, and she does her typical schtick. I don’t mean that to sound too harsh—I’ve seen 7 or 8 of her films, and I’ve developed a real affection for her. But I can’t rate her too highly as either an actress or a diva, though I do remember enjoying her performance as Ophelia in Amleto—I should probably rewatch to find out if memory serves me well. Still, she’s an aesthetically interesting presence, with her pale eyes, washed out on the orthochromatic film, set in that cherubic face. Visually Il fauno is a lovely film, and Mari and his cinematographer Giuseppe Vitrotti also sometimes make some interesting choices. I loved the opening and closing shots, with Febo Mari appearing as himself, theatrical impresario unveiling and subsequently drawing the curtain on the story. There are great uses of silhouette, time-lapse sky-and-sea shots, man-to-faun transitions, and a generally good quality of shot composition. Some shots are simple, but just very well-executed, such as this great sequence where Fede and the faun circle each other around a bust. 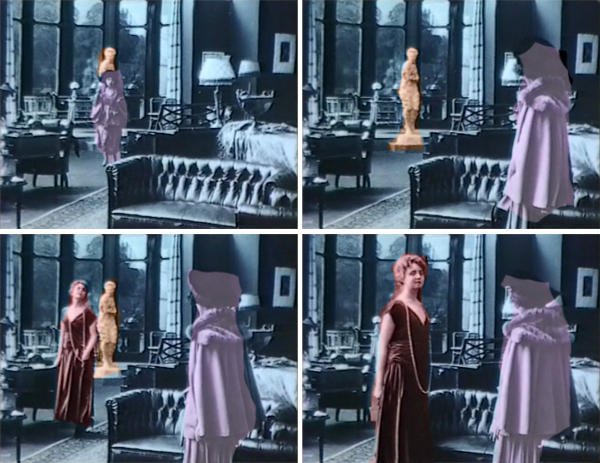 I also really liked the blocking in one of the final scenes of the film, when Fede visits Femmina to try to regain the statue of the faun. Fede enters from stage right, approaching the faun at the back of the room, moving forward left, then to the right foreground. Femmina enters behind Fede and follows a similar trajectory, eventually occluding the view of the faun and then symbolically and physically coming between Fede and her lover. It’s a nice piece of tableau staging. 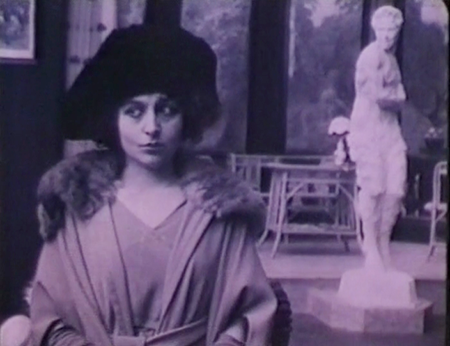 The real show-stopper, however, is a sustained, tightly framed shot of Fede approaching a door (presumably to the sculptor’s studio), via which she eventually enters. Running around 50 seconds in length, we see Mordeglia approach the grille in the door and look through, framing her face in extreme closeup, before the camera pulls back and then to the side, as she opens the door and enters. No surprise that the Museo Nazionale del Cinema Torino used this shot as the opener to their silent film showcase Lo splendore del cinema (2010)—it’s just a stunning shot, to which these GIFs really don’t do justice. I’m writing about Il fauno as part of Diva December, but it doesn’t precisely fit this (amorphous) category: alongside its symbolic and mythological flavour, there’s a certain realist strand present; nor is it truly a female-led film. However, it deals in many of the classic diva trappings: mirrors used to represent a character’s duplicity or split morality; wonderful dresses and hats; the ubiquitous knee-length length necklace; symbolic naming. And of course, flowers as a motif for feelings. My story, inspired by love, I gift to gentle souls. But should it not bring joy, then I say—in the words of Manzoni—believe that it was not my intention. Il fauno. Dir. Febo Mario. Torino, Italy: Ambrosio, 1917. Restored in 1994 by the Cinemathèque Royale Belgique (now Cinematek), from original nitrate prints from the Cineteca Friuli and the Museo Nazionale del Cinema Torino. This entry was posted in Film and tagged cinema of 1917, cinema of Italy, diva films, Elena Makowska, Febo Mari, Nietta Mordeglia. Bookmark the permalink. Thanks for the comment, T! Endearing is a nice word to describe the film, and yes, the transition is quite poignant. (Also, I am now tempted to watch the Tyra barbie doll film, lol).